Feel free to add your own questions here or contact us with them. Or put them on the Wiki Wish List. 2.2 Show or hide a layer, or fade the effect of a blur? 2.8 Draw a rectangle with a given width and height? 2.9 Draw a rectangle with rounded corners ? 2.10 Make linked Spline vertices not affected by Rotate layer? 2.13 Use an image as a fill color? 3.1 Use an external bitmap? 3.2 Import filmstrip image ? 3.3 Use an external Vector? 3.4 Import a movie into Synfig? 4.1 Make objects go behind each other, without moving layers? 4.2 Use a boolean parameter to hide a layer ? 4.3 How do I transform grouped objects? 4.4 Copy a complex convert combination between parameters of different layers? 4.5 Make an existing animation run at half speed? 5.1 Render to AVI with higher quality? 5.1.2 Rendering through a .png sequence. 5.2 Render an animation with transparent (alpha) background ? 6.1 Increase performance by optimizing during compilation time? To dock (join) separate windows (Panel into one you must drag the tab icons (the Panel tab) for each of the tools into another window. You can create subdivisions inside the windows by dragging the Panel tab into the Placement Widget. Tool tabs inside the window can be arranged by dragging them on top of one another, therefore changing the order. Use the Text Tool or right click on your Canvas and choose "<Layer> → <New> → Other → Text" . You can also create some text from your svg software preferred editor (inkscape for example) , create some text and import it into synfig. To rotate a figure (composed of several layers), we will use the Rotate Layer. Start by group the layers of your figure to rotate. Then add a Rotate Layer, with the handle position (green), center the layer rotation in the middle of the object. Finally, group layer Rotate and the group of your figure. The hierarchy of layers is implemented! To do the rotation, select the layer "rotate" created earlier and use the (blue) angle handle. To move the object (from left to right or up and down), use the primary group (the one at the top) with the handful of position. One way is to link a new region layer to the outline's shape. Select the outline you want to fill. In the Parameters Panel, right-click the Vertices parameter, select "Export", enter a name for the shape, and hit return. This will export the shape of the outline, making it visible in the Library Panel. 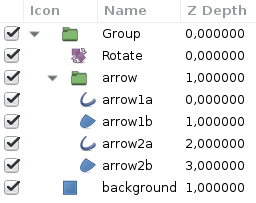 In the Library panel, open the ValueBase Nodes tree and select the name you just saved the shape as. From the Layer Menu (either context-click on the Layers Panel or use the Canvas Menu Caret) create a new Region Layer by selecting "New Layer -> Geometry -> Region". Ensure that the created layer is selected. In the parameter dialog, right-click the Vertices parameter and click "Connect". Now, if you don't need exported shape, you can unexport it: right click name of the shape in the Library panel and click "Unexport". Create a new region layer as above, and leave it selected. Don't make any changes to the outline layer, which you want to fill! (see the Tier 5 on the Linking page for details). Select both layers in the Layers Panel This will display only the parameters shared by both layers in the Parameters Panel. Context-click on the Vertices Parameter, and select Link. The Region Layer will snap to the shape of the Outline Layer. When you create an outline with the Spline Tool that you intend to be a filled area as well, make sure you select the Fill checkbox in the tool options dialog. Obviously, this doesn't help much if you realize later that you needed a fill here. If you are using the Draw Tool, there is a button at the bottom of the tool options dialog labeled "Fill Last Stroke", which creates a new Region Layer and links its shape to the previously drawn outline. Unfortunately, it doesn't work as of Synfig Studio v0.61.04. It has been fixed in the current SVN version of the code. Create a region with the same number of handles, and manually link each handle. If you want a region that depends on multiple outline layers, this is really your only choice for now. Use the draw tool, select only the outline to fill, draw a stroke roughly following the outline and make sure you're holding the Control key when you left go of the mouse button at the end of the stroke. This doesn't work 100% right at the moment. Right click on the starting point and then click on loop Spline. Note: It doesn't work unless the initial point has a tangent - ie the first segment is curved. But you can hide tangent handles (shortcut Alt3, or "Caret Menu > View > Show/Hide handles > Show tangent handles") and process as described. Don't forget to press (shortcut Alt3) after that to show tangent handles again. The Draw Tool has an option to "Extend" a spline. Also, you may be interest inserting an Item? . Right click on the spline segment you want to extend and choose "Insert Item - Smart". This will add an extra vector point to the line which is basically the same as "extending" it. For joining two splines together, place one endpoint above the other, select the end points of both splines (shortcut CtrlLeftclick , ⌘ CmdLeftclick on the mac, and draw a bounding box over the area to select both points), right click on one of them and choosing "Link" in the menu. The two lines will be joined, but you also need to link the bezier handles of each endpoint. To do that, extend each bezier handle so they are visible, select both, right click one of them and choose "Link Opposite". Then right click on the orange spline point that the bezier handles are connected to and choose "Merge Tangents". Then the two lines will function as one line. Draw a rectangle with a given width and height? Draw a rectangle with rounded corners ? Draw a rectangle using the Rectangle Tool. Draw circle (Circle Tool) and use each corner point of the rectangle as the center. Select the rectangle, right click on it and select "Insert item and keep shape" where the outline of the circle crosses the outline of the rectangle. Make linked Spline vertices not affected by Rotate layer? Look at the http://dooglus.rincevent.net/synfig/logs/2008/%23synfig-2008-02-07.log See also: Convert. The Advanced Outline Layer has an option for dashed lines. Create a Curve Gradient and an Outline over the same Spline using the Spline Tool options. Check both Outline and Gradient at the Tool Options Panel. Raise up the gradient layer (it is created below the Outline Layer). Modify the gradient Blend Method parameter to be Straight Onto. That would render the gradient onto the outline width. Also it wouldn't render the outline, so transparent portions of the gradient are transparent. Check the 'Perpendicular' parameter of the Curve Gradient Layer. Convert the Gradient Parameter of the Curve Gradient Layer to be one of those types: Stripes or Repeat Gradient. Modify the properties of the sub parameters to achieve the desired effect. You may be interested also in Brushes. When images are imported, the Image Layer is automatically grouped in a Switch Group Layer and with Group Transformation Widget you got an Origin. If your image is not grouped, just do, and you will take advantage of Group Layer or Switch Group Layer parameters ! Also, to be exhaustive, yes, the Image Layer doesn't have an Origin, but (...often a but with synfig isn't it ?...) selecting both handles of the Image to move them together is similar of moving image origin. Nota, to select all the Image Layer handles, use the shortcut CtrlA ! Use an image as a fill color? Make a new object (outline, region, squares, circles, polygons all work) Import the image you want as the fill color, and put it on the layer underneath your object. Set the blend method of the image (using the Parameters Panel) to "onto" or "straight onto". Group the object and the fill color image, otherwise everything below the image will have the same fill color. Be sure to have a look at what the other composite options do as well. Check generic informations and all 'Import Artwork' related documentation page from the Import Art category. From the main or caret menu, choose "<File> → Import". PNG with alpha channel works fine. To animate it without accidental stretching, right-click on the layer and choose "Group Layer" action. Using the Group Transformation Widget you can then animate the Group Layer instead of the Image Layer's bounding box. To import a series of images (TGA, etc) as frames of an animation, on a layer, use 'lst' files of a list of images. I've used this to develop a walk cycle. See Walk cycle for an example. Synfig doesn't yet support vector import because no-one has written an import process yet. You can use the Svg2synfig converter, or import it as a bitmap and trace over it in synfig. If you want to implement vector import we would gladly accept your patch. Import a movie into Synfig? File:Convert-movie-to-png-seq.sh : Nautilus (Gnome file manager) script which creates a png-sequence from a given movie file and creates a list-file which you can then import into Synfig. By rylleman , Synfig forum thread for more info. To import manually a movie into synfig there is only one option for the moment: Extract an image sequence and of sound file from the movie and import them using ListImporter and Sound Layer. where "seconds-start" are the seconds where you want to extract form and "duration" is the number of seconds you want to extract from "mymovie.avi". Also the image format specified in this case is "png" but "jpeg" or "tga" can be used also. See mplayer manual page for more info. It would extract a set of files of the selected section of the movie. Each file takes the frame number padded with leading zeros as name. Extract audio of a movie and import them using Sound Layer. Make objects go behind each other, without moving layers? You'll notice each layer you make has a number in the "Z Depth" column in the Layers Panel. Say you have 3 layers, they will be numbered 2 (lowest, e.g. a square) 1 (eg a circle) 0 (highest, the default, e.g. a line). In order to make layer 1, the circle, pass behind layer 2, the square, in the Parameters Panel, change its "Z Depth" to be 3 or more. The "Z Depth" of the circle needs to be greater than 2 in order to be behind the square. To make the square on top of everything, you'd change its "Z Depth" to -1 or less. Positive numbers on the z axis go into the screen, and negative numbers go out of the screen, towards the viewer. It is possible to animate this effect, but each layer is discrete. They seem to go from lower than -9999 to more than 9999. In addition, objects in grouped layers can only go behind other objects in the same grouped layer. However an grouped layer can go behind another grouped layer. Check additional informations in Z Depth page. Use a boolean parameter to hide a layer ? You can use set the amount's layer parameter to Constant Interpolation. Or you can convert the Amount Parameter to a Switch value and give 0 and 1 to the Linked OFF/ON values. How do I transform grouped objects? Right click on the Grouped object in the Layer dialog and choose "select all child layers". Then you select the handles you want to transform (usually just all of them, like for rotating the object), and the rotate or scale tool and do the work. Copy a complex convert combination between parameters of different layers? For example: you want to copy a complicated conversion type that you have in one parameter from a layer, to other parameter (maybe not a root parameter, but a sub-parameter) of other layer. If you export the complicated conversion type from the original layer and then go to the other layer and select Connect (right click and the exported and the parameter both selected) then you have the parameter form the second layer to be exactly the same than the original one. But there is a drawback: if you modify one of the sub-parameters in the complicated conversion type (e.g. you change the value of one of them) then automatically the same sub-parameter of the other layer is changed. How can you copy the conversion but allow modify the sub-parameters independently on each layer? Once you have achieved the complex conversion type in the original layer, don't export the root parameter! If you have done yet unexport it. (Why?. You will understand it later.) Now duplicate the original layer. Then you should obtain the same layer with the same conversion type placed at the same parameter (but not exported). NOW export the parameter from the duplicated layer. Then go to the (sub) parameter of the layer where you want to copy the complex conversion type and Connect it to the just exported parameter form the duplicated layer. Now delete the duplicated layer (!). Then the exported ValueNode still undeleted and the layer where you wanted to copy the complex convert type have a (sub) parameter connected to it. You can unexport the ValueNode or not. It is up to you. But notice that the conversion type is already copied into other (sub) parameter of other layer and they are independent as well as you can change one of them (by modifying the sub-parameters) and the other remains untouched. Make an existing animation run at half speed? If you have an animation that runs from 0s to 10s and you want it to run at half speed from 0s to 20s, how can you do that? Or, putting waypoints on the 'time offset' param would work too: 0 at 0s and -10 at 20s. (The choice between using a linear convert and valuenodes is entirely up to you. They both achieve the same result in this simple case). (*) if your animation is longer than 1h then set this parameter to EOT (End Of Time) what is the same as Infinite (INF) for a real number but for a time parameter. Maybe you will need also to take a look at How do I transform grouped objects? Make a 12 point red star. On top of the red star make a yellow 3 point star. 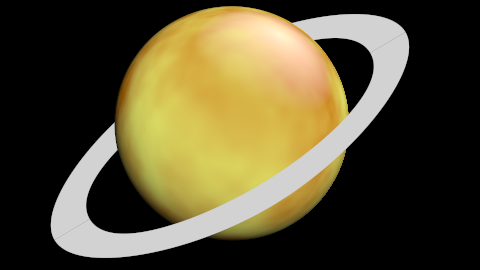 Select the yellow star and grey out the "Origin", "Inner Radius" and "Outer Radiu"s points (right click on the points and convert them to "Greyed"). Leave the blue "Angle" point as it is. Select the group that contains the drawings to be switched (in the attached example it is the hands folder). Note, that this can be an external imported file, which adds a possibility to use library of hands! In the parameters panel enable "Z-Range" checkbox. Right-click on "Z-Range Position" and convert it to "Integer". Click the little triangle next to "Z-Range Position" to open it and right click on "Link" and export the value and name it "switch-pos" or whatever. In the Parameters Panel right click on "Angle" and convert it to "Scale". Click on the little triangle next to "Angl"e to open it and convert the link to "Integer" and change the amount in "Scalar" to "30". Click on the little triangle next to "Link" to open it and connect the second link to the exported "switch-pos" value. Your switch controller is now active. Rotate the controller to change the hand shapes in the hands folder. Render to AVI with higher quality? Render your animation to yuv420p format. To do that select that target at the drop down list of the render dialog and add the ".yuv" extension to your animation name (without quotes). Change the animation file name to your one. Rendering through a .png sequence. for mid quality H264 mp4 file (try to change CRF from 15 -high quality- to 25 -generally satisfactory for animations-). H264 codec requires both width and height of source frames to be multiples of 16. If you want you can also use mplayer. Render an animation with transparent (alpha) background ? 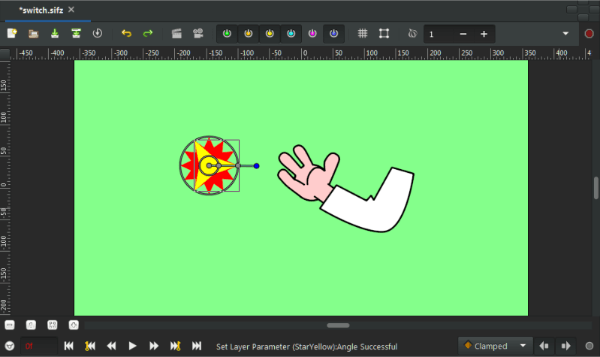 You can create final and alpha mask video in one time direclty from synfig. Synfig (cli) : From the command line interface (CLI) use "--extract-alpha" option. You also can render has "PNG". That will produce a "lossless" quality image sequence, then import this image sequence in your preferred video editor to compose the video. You can also import the PNG image sequence in a video editor that supports video alpha channel (like Blender) to export it has video + alpha. Increase performance by optimizing during compilation time? First flag will be "-O3" (ow three). "-02" is normal optimization. "-03" is hard optimization. now go to man gcc and search "-mtune"
find your cpu and add "-mtune=your-cpu -march=your-cpu" to CFLAGS. Then look at flags from /proc/cpuinfo and search it in gcc manual For example I have 3dnow. So I can find "-m3dnow". For sse I can find "-msse" and "-mfpmath=sse" (can make program unstable). Finaly you may add "-ffast-math" to disable math checks. But it can make program unstable. export CFLAGS="-O3 -pipe -mtune=athlon-xp -march=athlon-xp -mmmx -msse -m3dnow -mfpmath=sse -ffast-math -funsigned-char -fno-strict-aliasing"
export CFLAGS="-O3 -pipe -mtune=pentium3 -march=pentium3 -msse -mfpmath=sse -funsigned-char -fno-strict-aliasing"
Synfigs file format sifz is a packed sif xml-file which can be edited in a text editor and eventually fix each section easily. You cannot however directly unpack the sifz file. Rename the file with the extension .sif.gz and you'll be able to unpack it. Rename your file from "myfile.sifz" to "myfile.sif.gz". The extension "gz" tells to the OS that it is a compressed file. Now use your convenient application to uncompress the file to "myfile.sif". Unrar for windows will do the job. SIFZ format is just a gzipped XML file, so rename the file to .sif.gz. Find a problem line (Synfig will tell you the line number). Fix the problem. Usually, it isn't hard, because XML is pretty human-readable so look for some trash in values, extremely big/low parameters, messed tags, etc. Open with Synfig and if everything is OK save it back as .sifz. Well, in general, whenever I click on a point to edit it (say, to make it move somewhere in animation mode), there is a decent chance that I click on a tangent instead. Then, if I want to right click the point itself, I usually right click the tangent marker instead. It isn't that big a deal, but simplicity at the cost of power generally is a good thing, especially when it will save a few mouse clicks. 2) Add a Supersample Layer over the layers that has the antialiasing parameter disabled. A value of 4 for the height and width values is usually enough. Maybe you need to check "Alpha Safe" for better results. This tip is particularly useful when you want to have a region over and under other composition at the same time. It has the draw back that intermediate layers has to be super sampled too (line the planet in the example) because the super sample has to be done at the same time to the involved regions (the back and top half rings). This page was last modified on 15 October 2016, at 14:25.